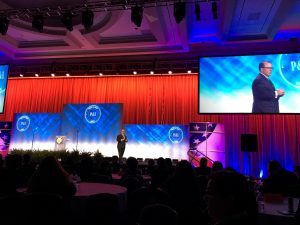 It was a great day for attendees at today’s NACHC General Session. George Sigounas, Administrator of the Health Resources and Services Administration (HRSA) announced a funding opportunity of $200 million for health centers to boost access to high-quality integrated behavioral health services, including prevention or treatment of mental health conditions and/or substance use disorders, including opioid use disorder. This was big news for health centers already working hard on the front lines of the national opioid use epidemic. 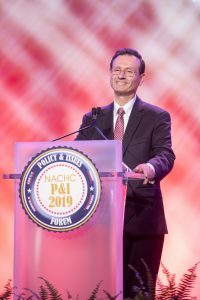 Sigounas noted that health centers are critical to the national strategy of addressing the opioid crisis and underscored HRSA’s commitment to continue investments in the treatment and prevention of substance use disorders through behavioral workforce expansion and training, telehealth and connecting stakeholders. Sigounas also said that the health center work “demonstrates our commitment to shared goals,” such as reducing maternal mortality rates, addressing the HIV epidemic, reducing childhood obesity and promoting health care technology. Tomorrow’s General Session will focus on the policy developments regarding immigrant care and present health center staff and patients will tools and resources to address health care and social service challenges. 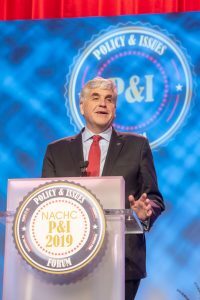 Stay tuned and keep following #NACHC19PI.